You should never ignore an oil spill. If you change your own motor oil, or if you refuel lawn mower or chainsaw, it’s likely that you’ll eventually spill some motor oil and need to clean it up. Did you know that a single quart of motor oil can pollute 250,000 gallons of drinking water? While you can lift old stains, up to 30 days, with solvents, it’s dangerous to do so. However, for fresh spills, you can get the majority of the oil up if you act quickly and follow these directions. If the oil spill is fresh, throw down as much cleanup compound as it takes to absorb the oil. If you don’t have cleanup compound, use paper towels, replacing them as soon as the towels are soaked with oil. Then, go to the nearest auto-parts store and buy a 5-pound bucket of cleanup compound. Spread the compound on and around the spill. Let it sit according to the manufacturer’s instructions. Using a push broom and dustpan, sweep up the compound as it begins to absorb the oil. Each time you sweep up the used compound, add more compound and allow it to sit and absorb more of the oil. Do not use kitty litter unless it is made of newspaper, wood chips, or other absorbent material. While litter made from these materials will soak up oil, you should still follow up with a cleanup compound. Once you have the bulk of the oil absorbed and cleaned up, you’ll need to emulsify the remaining oil, so that it doesn’t solidify and become impossible to remove. Fortunately, motor oil has a lot in common with other oils. Thus, if you add soap and warm water to the oil, you emulsify it, or keep it from turning into a solid. To emulsify the oil, spray the remaining spot with dish-washing detergent and warm water. Then, use a broom or bristle brush, not wire, to scrub the oil spot to emulsify it. Then, use more compound to absorb the resulting liquid. Do not use solvents on asphalt. 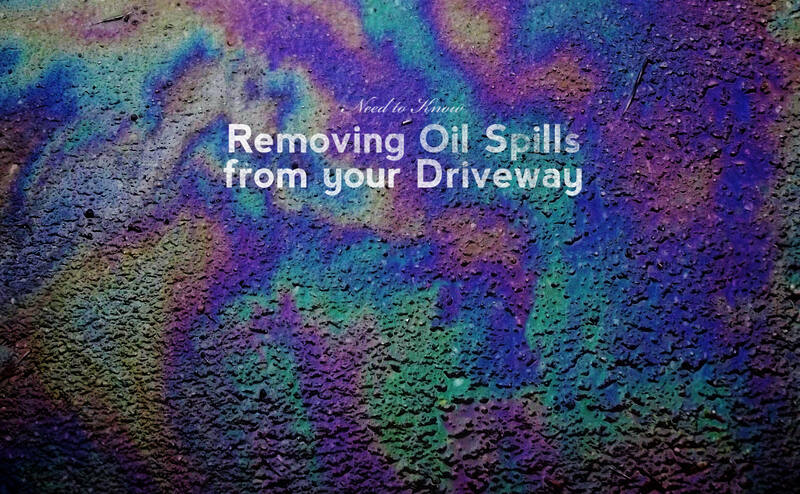 If your motor oil spill is on concrete, however, you can use solvents, such as kerosene, paint thinner, or other hydrocarbon-based solvents. However, this step should only be taken if there is any remaining oil that won’t come up with other methods. Add small amounts of the solvent and allow it to soak into the stain. Rub lightly to absorb the dissolved stain. Do not throw away the rags or towels used to clean up the oil, but dispose of them as suggested by the BC Recycling Council. They will spontaneously combust if thrown in the trash. Warning: If you must use solvents, do so with extreme caution, as these materials are highly flammable. Wear gloves, be safe, and follow all of the local bylaws.